The Quino Checkerspot Butterfly (QCB) was once an extremely common species in San Diego County; however, due to extreme habitat loss, fragmentation, and changing weather conditions--the species faces rapid decline. 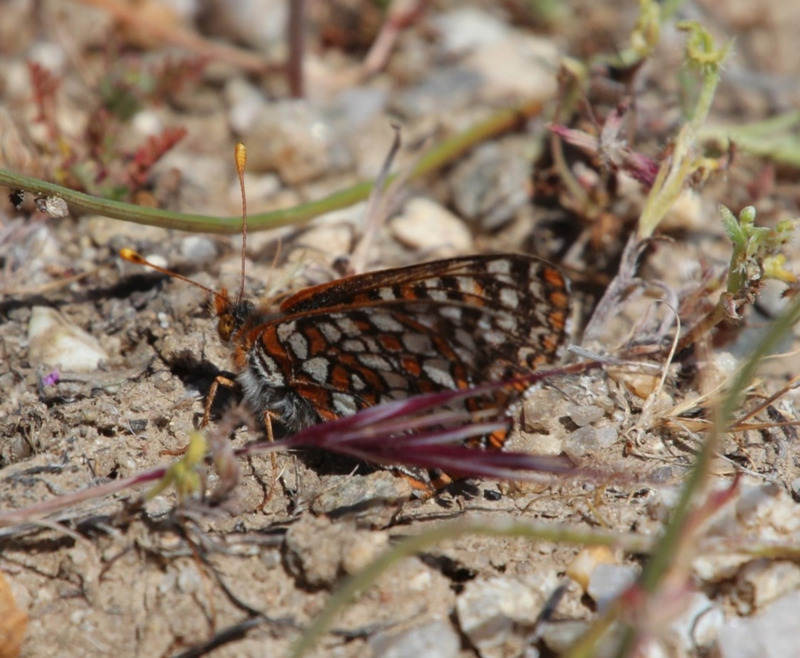 Quino Checkerspot Butterfly (QCB) are found in open margins of scrub habitat where dominant plant species may include California sagebrush (Artemisia californica), chamise (Adenostoma fasciculatum), and non-native/native grasslands. There must be larval host plant and suitable nectar sources nearby in order support this species. The primary host plant utilized is Plantago erecta, however, they may also use Castilleja exserta, Castilleja densiflora, Antirrhinum coulterianum, or Cordylanthus rigidus, when available. Nectar sources for adults are equally important and must have a short corolla tube in order for their short proboscis to reach the nectar. Common nectar sources include Lasthenia californica, Linanthus dianthoflorus, Cryptantha sp., Plagiobothrys sp., and Amsickia species. A site assessment should be conducted prior to the initiation of surveys in order to determine if suitable habitat exists within the project impact area as well as map excluded areas. Excluded areas include: orchards, developed areas, small areas of non-native vegetation surrounded by urban development, active agricultural fields, forests, riparian areas, and closed-canopy shrub-lands and chaparral. Surveys are to commence during the third week of February and surveyed on a weekly basis ending by the second Saturday in May. If QCB is found within the first five week of the survey effort, then surveys do not need to continue. However, if no QCB are found during the first five weeks, surveys must continue until the end of the season or until QCB are detected. Surveys should be conducted at a rate of 5-10 acres per person-per hour; however, due to topography and other factors-this rate may vary. Surveys cannot be conducted during fog, rain, drizzle, sustained or gusting winds greater than 15 miles per hour. less than 60 F when cloud cover is less than 50%, or less than 70F when cloud cover is more than 50%. QCB was federally listed on January 16, 1997 and there is currently 62,125 square acres of designated critical habitat in San Diego and Riverside Counties. Based on personal observations in the last couple of years in San Diego, it appears that the drought is significantly affecting the species emergence due to the decrease of host plant and nectar sources. Areas that previously supported QCB with healthy host plant and nectar sources have not had any individuals emerge in 2014 and 2015 and observed host plant patches had severely decreased in size since 2013. U.S. Fish and Wildlife Service. 2003. Recovery Plan for the Quino Checkerspot Butterfly (Euphydryas editha quino). Portland, Oregon. x + 179 pp.